A Bricks 4 Kidz School Workshop takes learning out of the pages of the textbook and into an imaginative, 3-dimensional, hands-on learning experience! A Bricks 4 Kidz School Workshop takes learning out of the pages of the textbook and into an imaginative, 3-dimensional, hands-on learning experience! Use the LEGO® bricks your students already know and love to get them excited about learning. A Bricks 4 Kidz School Workshop is a fun-filled, engaging experience that kids will be talking about long after the fun and learning has ended. Bricks 4 Kidz programmes are kid-tested and educator-approved to deliver valuable learning experiences that correlate to a variety of cross-disciplinary curriculum objectives. Every lesson introduces kids to enriching content related to the model, presented in a question and answer format designed to spark the children’s curiosity and draw them into a discussion. 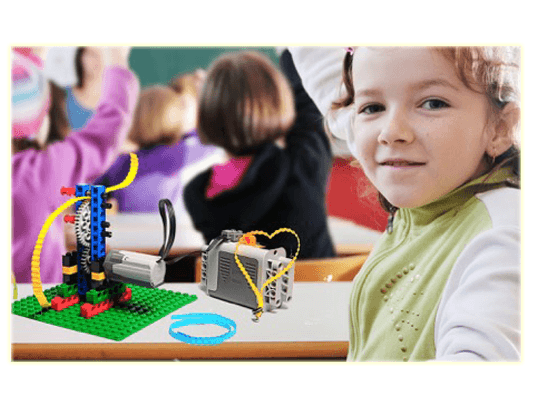 The Bricks 4 Kidz approach to learning connects with the auditory, visual, and kinesthetic learning styles of children as students listen to the lesson presented by the teacher, look at the model plans, and use their hands to put the model together. At Bricks 4 Kidz our teachers will come to your school. We offer Workshops for as little as one class or as many as 6 in one day. Our teachers bring everything you need to let the kids learn and play. Bricks 4 Kidz offers many workshop themes ranging from ancient history to energy is everywhere, from sports spectacular to construction equipment, covering subjects like simple machines and laws of motion. Screened and trained Bricks 4 Kidz teachers deliver everything needed for an hour of learning, building and playing, including LEGO® bricks, full-color model plans, and follow-up materials for teachers and students. A Bricks 4 Kidz School Workshop can be a reward or incentive for your school, a way to reinforce curriculum objectives, or just a fun and enriching experience for your students! To hear more about our In-School Workshops please call Elaine!